florida girl in dc: Paleo: What Happened After I Went Off Whole 30? Paleo: What Happened After I Went Off Whole 30? All of January, I had been so good (well, except for that Inauguration gluttony, but that was a special occasion.) By the end of the month, making paleo-friendly choices wasn't even that hard. I had a lot of recipes and was having fun tweaking them. I was inspired to blog again. And, I just felt plain better. Yes, I lost weight. My scale battery was dead and I didn't want to be obsessed, so I don't know how much. Enough that clothes were loose. Enough that skinny jeans weren't skinny. But, more importantly, I felt better. Stronger. Leaner. Smarter. I didn't have those 3pm doldrums at work that drive me to a third coffee of the day. When I went off in February, I didn't go too crazy. Some things just didn't look good to me anymore. My favorite thing that I added back was Greek yogurt (my breakfast staple.) The first time I ate pasta, it straight up gave me a hangover (well, a headache and nausea.) I've had it since then and been ok. But I don't feel as good. So, here's the deal. I'm not gonna turn into the paleo police. But I'm back on it - with the addition of wine/cocktails and dairy. My Dad is now doing it also, so we're keeping each other honest. 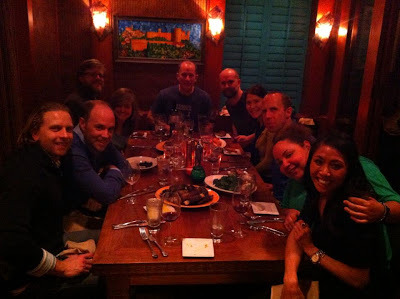 To celebrate making it through January, our whole-Whole30 crew went out to dinner at Dino in Cleveland Park. We had an amazing paleo-friendly meal - olives, pickled vegetables, crispy duck, Brussels sprouts with pork belly, grilled chicken, short ribs, sweet potatoes and kale. It was gluttonous and fabulous. And, for the most part, what I learned was that everyone was feeling like I was. Our habits had changed. We all recognized that we felt better, and even without Grant egging us on, most of us were already back on the program. This doesn't mean that I'm not going to eat one of Nikki's cupcakes tonight at the Oscars party. But it means that my dish is gonna be this Salad Shirazi, inspired by Argo. Looking for something to ease the party temptation, taste amazing and also be on theme, I discovered this fantastic Persian food blog, Turmeric & Saffron. So, happy eating. I'll just be trying to be 80-90% meat, seafood, vegetables, fruit, nuts and fats. My 10% will be saved for things that truly rock my world. And I'll share the best of them here. Thanks for your support. I appreciate the update. I always wonder what happens next after a plan is implemented. late to comment - sorry. the food police make me creeeeazy. i'm a 6/7 vegetarian (occ. fish) could never do paleo though i'm sure it's great for your body. people get NUTS about you eat this, what are you, did you cheat? it's like, i ate what i think makes me healthy or feel good. isn't that what it's about??? :) great posts.